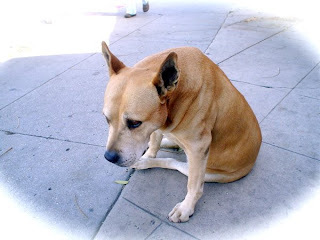 GOD and DOG BLOG: Who Cares about Dogs when People are Starving? Who Cares about Dogs when People are Starving? People can get pretty emotional when they encounter the efforts of animal welfare advocates, especially those devoted to rescuing pit bulls. When there are millions of human beings starving (Darfur, anyone?) all around the world, why do these crazy animal nuts run around trying to rescue stupid dogs and cats? The answer to this question is complex and probably more than I can present in a blog. I will try to present a few theories as briefly as possible. Human beings can become unusually attached to animals when they have suffered at the hands of other human beings. For example, research on sexually abused children has demonstrated that although some children were unresponsive to therapists, when presented with a dog to "befriend," the children would often overcome their barrier and communicate with the human adults. This same type of "transferred" response has been used successfully in aiding children with learning disorders. Human beings are not always easy to help. Many people who have volunteered to help the homeless, or domestic abuse victims, become discouraged when they watch someone return to patterns of behavior that keep them trapped in pain. Social workers burn out when they see mothers continually using drugs as their children remain neglected. With animals, the happy endings tend to be more simple and less time-consuming. Rescuing a tortured animal, healing it and finding a loving home are relatively simple compared to doing the same for a human being. Issues like worldwide hunger or human rights violations can be overwhelming for some people. Tackling such huge problems involves domestic and international political negotiations. Well-meaning dollars and tons of food have been funneled by the millions into desperate countries, only to have it all absorbed by corrupt officials. Years later, many of these same countries remain as impoverished as ever. This is not to say that we should ignore human needs; of course not, that would be ridiculous. But it would be equally ridiculous to pretend the brutal abuses of "lower" animals at the hands of human beings are insignificant. The type of behavior above is a "threshold behavior." The person inflicts abuse on a helpless animal because he thinks it is morally and legally okay to do so. If there is no repurcussion for such behavior, the person has successfully broken a threshold of violence which can then escalate to - in this case - his girlfriend. If Jeffrey Dahmer had been arrested and incarcerated/given counseling for torturing and killing small animals, is it possible that the young men he murdered might be alive today? When you consider that we use these "worthless creatures" to heal and comfort the emotional scars of human beings; to guide those who cannot see, hear or walk; to assist and protect officers of the law; to rescue those caught in fires and avalanches; to work and love and die for us - does it really make sense to demean a call to give them a modicum of decency and dignity in their short lives?